Hollywood lost the knack of creating multi-leveled character dramas quite some time ago. For these, movie lovers now have to look to Europe, Asia—and to the Middle East. The work of Asghar Farhadi, the Iranian writer/director, is knotty and ever engrossing, illuminating moral and ethical concerns in the contexts of domestic stories always rooted in immediate social reality. The recent films of the Israeli director Avi Nesher (who worked in Hollywood in the 1990s, largely on genre pictures) are not dissimilar—full-bodied, complex, densely written. His latest, “Past Life,” is a story about reckoning with the past that begins with a bang. The year is 1977. An Israeli choir is performing a concert in Berlin. In the audience an older woman peruses the concert program. She looks up the name of the lovely young woman giving a soprano solo during one piece. She recognizes that name. At a reception afterwards, the older woman, Agnieszka (Katarzyna Gniewkowska), approaches the young singer, Sephi Milch (Joy Rieger). Sephi speaks no German or Polish, and Agnieszka speaks no Hebrew. And yet, in the course of a fraught exchange during which Agnieszka grasps Sephi’s wrist most aggressively, the point is made: Agnieszka knew Sephi’s father, and Sephi’s father was a murderer. Back home in Israel, the father we meet does not square with that description. Baruch Milch (Doron Tavory) is stiff and strict with his family but in his practice as a physician he’s both no-nonsense and honestly compassionate. Sephi tells her older sister, Nana (Nelly Tagar) about her odd Berlin encounter and Nana, a journalist, takes up the story. Together they make some discoveries that disturb the hell out of them, and they confront their father. Baruch does not flinch. Rather, he welcomes the opportunity to unburden himself of the past and set the record straight. As a persecuted Jew during the Holocaust, he was protected by a Polish family. But he did not get out entirely “clean” so to speak. The thread of discovery in this film’s storyline is accompanied by others. There’s Sephi’s musical work. She’s a singer, but also a composer, and her academy instructor is extremely discouraging. “Focus on your singing, not your dreams.” Her deliverance of sorts comes in the form of a visiting composer from Germany. Who happens to be a relative of the woman who accosted her at the concert in Berlin. In the meantime, Nana remains suspicious of her father, and her lack of faith in him turns into a disillusionment with life itself—which is of little help to her spirits once she learns she has cancer. 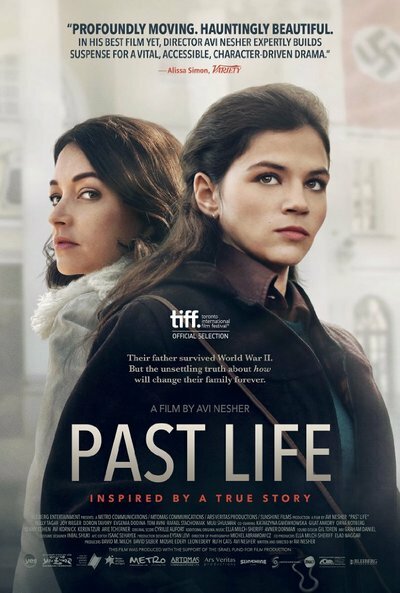 If “Past Life” stumbles at all, it’s in the scenes in which it intercuts between Nana’s medical traumas and Sephi’s continued detective work on a trip to Warsaw—the idea of a certain kind of faith constituting a sort of lifeline is made too literal for my tastes here. But the movie shines in all other respects. The characterizations are spectacularly convincing across the board, the acting honors those characterizations fully. The period detail is present but not ostentatious. And the movie’s climax, in which all the threads are not-quite pulled together, is a very moving one, one in which forgiveness is sought, and the difficulty of bestowing forgiveness is acknowledged. This is a striking and thought-provoking picture.